I'm not a native english speaker, so the recipes we bake are sometimes challenging for me. Although I learned a lot during these past years of baking I still have troubles sometimes figuring out what the author wants to tell me. And while I claim to be as good a non-native can be when it comes to speak about politics, economy or football - I still have serious troubles in understanding the directions for shaping a dough. In this respect, while the recipe itself for the X-Cookies was no that difficult, this recipe was not made for me. Seriously, up to now I have no idea what I should have done with the dough and the filling. Therefore (and because I am kind of clumsy anyways and shaping a dough nicely is not one of my strenght), at some point I decided to forget about X-es and do what I can: shape filled logs and cut them in rugelach-style. I'm sorry I didn't even nearly do what I should have done, but I really didn't get it. 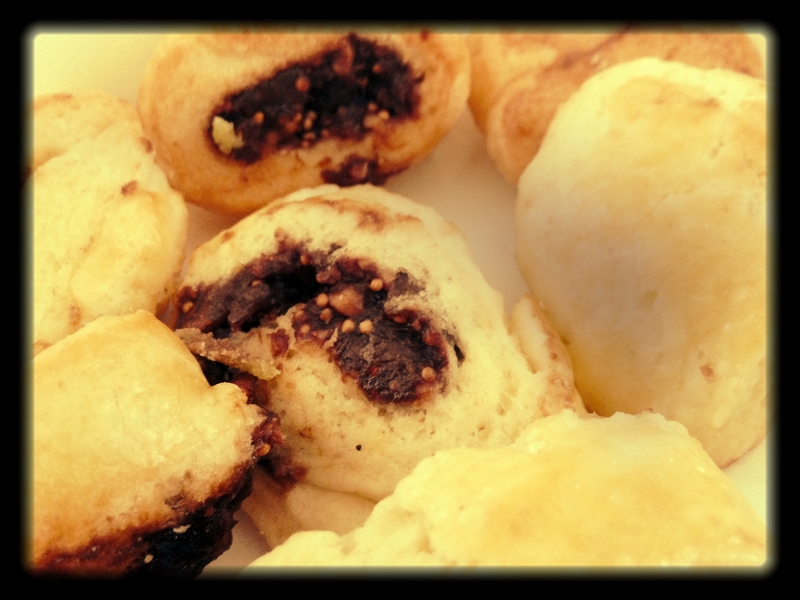 So, see here my version of X-cookies, the rugelach-way. Oh, before I forget it: cookies and filling are excellent! A bit christmas-ish, already, with the figs, nuts, cinnamon and chocolate, but really excellent! For the recipe, have a look at p. 318 in Dorie Greenspan's book "Baking with Julia". And to find out, what X-Cookies really should look like, turn to the other bakers blogs! Good for you for pushing through these recipes that you have trouble understanding. Sometimes I don't understand the direction too, and I speak the language quite well! I am sure they taste the same whether they are formed in an X shape or not. Great job! At least you liked them! Your way I'm sure was a lot less time consuming. Kudos to you for working your way through this book. hey, it all tasted the same! glad you liked them. I love rugelach, so that was a great idea! When I made these, my kitchen smelled like it does at Christmas. 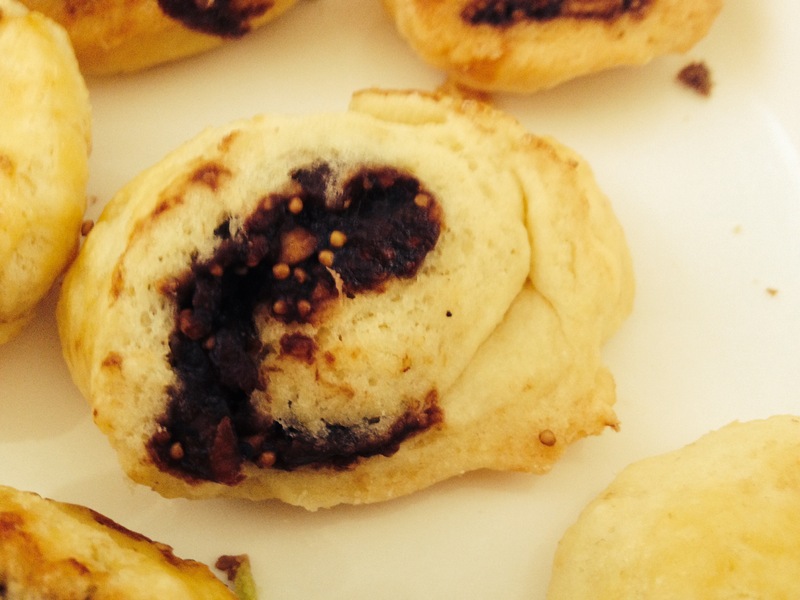 They kind of are like a rugelach cookie! Good idea!! I think these cookies could be shaped in lots of different ways.